Bus services in Dumfries and surrounding areas. For bus timetables for journeys in Dumfries and surrounding areas, please view the Bus timetables. GoSmart is rolling out to the rest of Dumfries and Galloway starting in Dalbeattie and Kirkcudbright. Through our experience in Dumfries we are tailoring our service to the individual locations working with the local community and partner organisations. In the first instance we have produced Active travel mapping of Dalbeattie and Kirkcudbright which can be found below. to find out about which ticket is best for you. 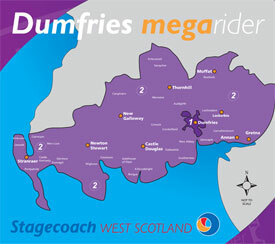 Dumfries town MegaRider - providing travel in Dumfries Town including Locharbriggs, Georgetown, Lochside and Lincluden. Dumfries & Galloway MegaRider - providing travel in all of Dumfries and Galloway. Megarider tickets can be purchased on a daily, weekly, monthly, quarterly and annual basis, covering the Dumfries network or the entire Dumfries and Galloway area. Daily and weekly tickets can be purchased from the bus driver. Longer tickets can be purchased online. Stagecoach's Flexirider gives you a great discount on single fares, giving you ten for the price of eight. A Flexirider is value between two specific points, for 28 days from the date of purchase. You can buy a Flexirider from your bus driver. For fare information, call 01387 253 496. If you only travel by bus once or twice per week, it's cheaper to purchase single or return tickets. You can purchase adult, young persons or child tickets from the bus driver. Purchasing a return is generally cheaper than purchasing two singles. GoSmart Dumfries can provide you with information on getting the right bus fare for you, including weekly MegaRider tickets and information about concessionary fares. Email us on info@gosmartdumfries.org.uk or phone us on 0800 0234 586.